The US Bureau of Safety and Environmental Enforcement’s SafeOCS program has released its 2017 annual report on Blowout Prevention System Safety, noting 18 of 25 operators associated with rig operations in the Gulf of Mexico (GOM) reported 1,129 equipment component failure events. The reported events occurred on 45 of the 59 rigs operating in the GOM during the year. The report summarizes blowout preventer (BOP) equipment component failures that occurred on marine drilling rigs. The 18 reporting operators account for 90.2% of new wells drilled. Both types of BOP stacks (subsea and surface) were associated with component failures, and the majority of notifications were associated with the more complex subsea BOP stacks. 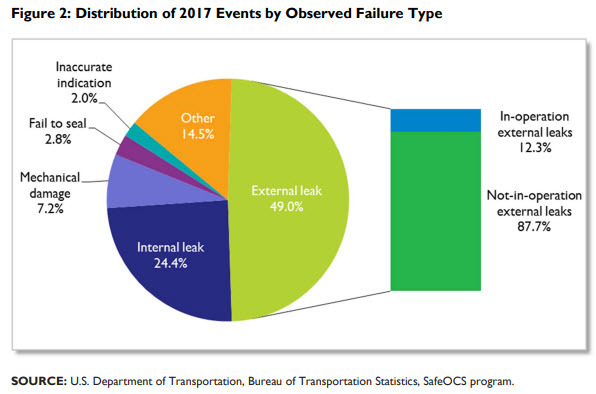 Leaks remained the most frequently reported observed failure, and wear and tear remained the most frequently reported root cause of failure events in 2017 as they were in 2016. There were 1,044 subsea events (92.5% of total events) reported to SafeOCS, approximately the same percentage as reported in 2016 (91.8% of total events). Of those events, 86.4% occurred while not in operation (i.e., on deck, during deployment, or during retrieval), an increase in not-in-operation events from 2016 to 2017. Of the in-operation events, eight led to stack pulls, and one of the eight resulted in a loss-of-containment event involving synthetic oil-based mud (drilling fluid). Find the report here (PDF).